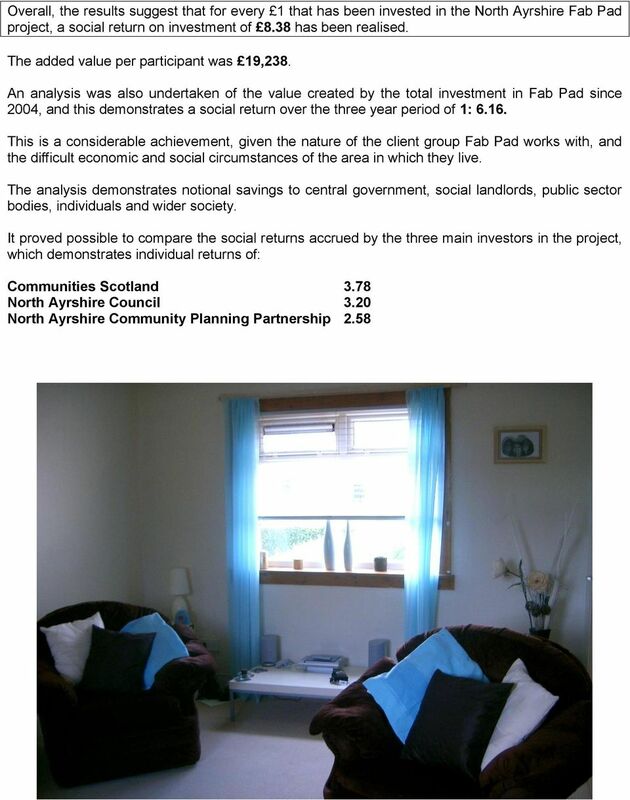 Download "North Ayrshire Project. Impact Arts. 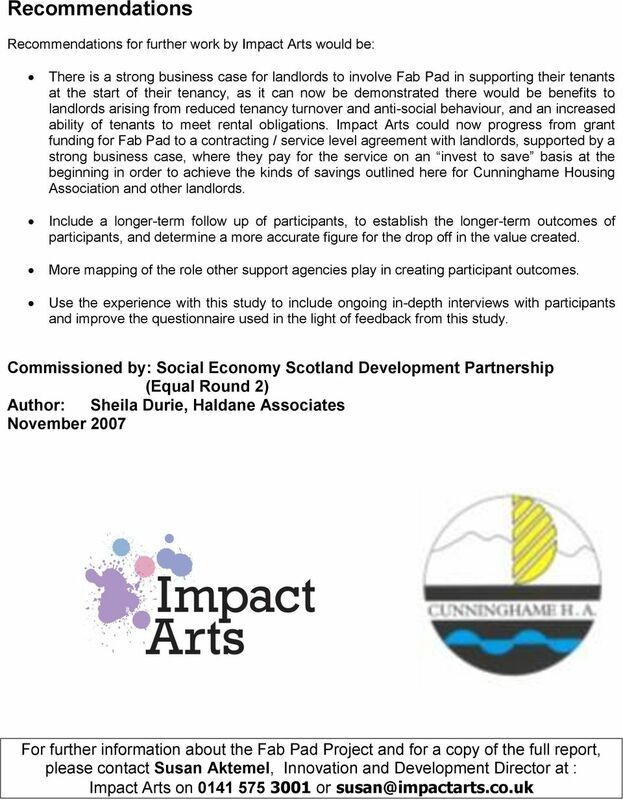 Social Return on Investment Report"
5 Angela s Story I have never been homeless but have a history of moving from tenancy to tenancy. Over a period of 12 years, I had 5 tenancies. This was mainly due to the growth of my family. I have 5 children and began dabbling in drugs 13 years ago. I began taking hard drugs on a daily basis and missed out on my children growing up. Her growing dependency on amphetamines and heroin meant that the children were in her care most days when she was under the influence and Angela says that at the time she did not realise the danger that her children were in. Angela s mother looked after the children and she says that if it had not been for her mother, the children would have been taken into care. Although I was trying to come off drugs just before starting Fab Pad, with their help and support, and also support from Vernon Centre (Addictions Team) I have managed to stop completely. I would probably still be at home taking drugs and maybe my children would be in care now. I would definitely be isolated in the house and the children would be too. I have learned to be patient, especially with the children To work hard and able to get results To socialise with people DIY skills e.g. measuring, scaling up, wallpapering, tiling, painting. Calculating amount of paint/ paper needed in a room, basic wall preparation, how to use power tools Making use of and renovating materials I already have in the house Budgeting and learning how to save money myself so that I can spend it on the shopping trips. The process of design/planning and organising. 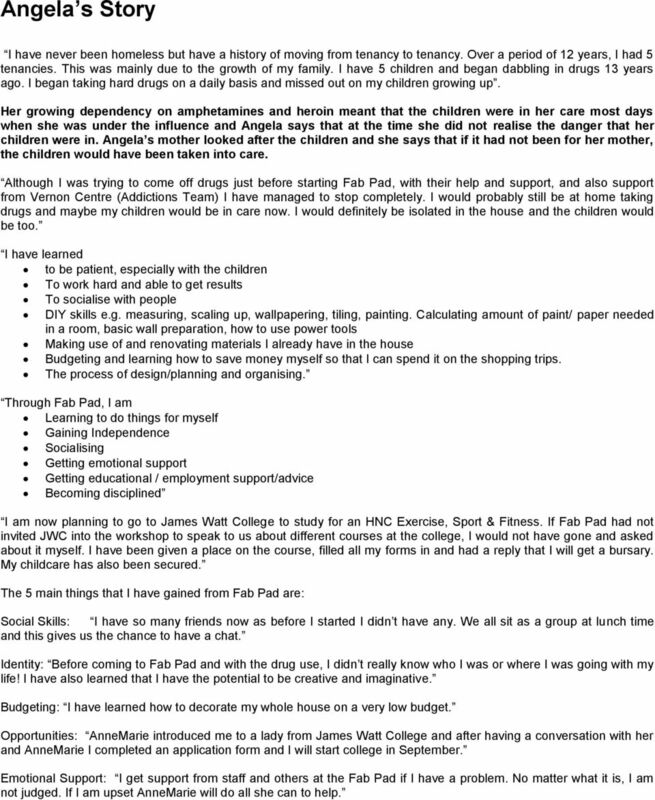 Through Fab Pad, I am Learning to do things for myself Gaining Independence Socialising Getting emotional support Getting educational / employment support/advice Becoming disciplined I am now planning to go to James Watt College to study for an HNC Exercise, Sport & Fitness. If Fab Pad had not invited JWC into the workshop to speak to us about different courses at the college, I would not have gone and asked about it myself. I have been given a place on the course, filled all my forms in and had a reply that I will get a bursary. My childcare has also been secured. 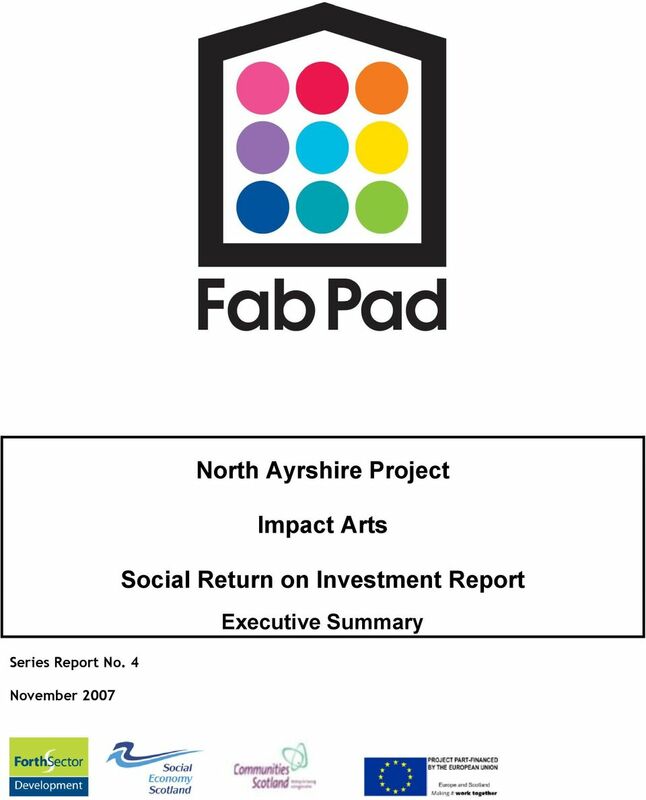 The 5 main things that I have gained from Fab Pad are: Social Skills: I have so many friends now as before I started I didn t have any. We all sit as a group at lunch time and this gives us the chance to have a chat. Identity: Before coming to Fab Pad and with the drug use, I didn t really know who I was or where I was going with my life! I have also learned that I have the potential to be creative and imaginative. Budgeting: I have learned how to decorate my whole house on a very low budget. Opportunities: AnneMarie introduced me to a lady from James Watt College and after having a conversation with her and AnneMarie I completed an application form and I will start college in September. 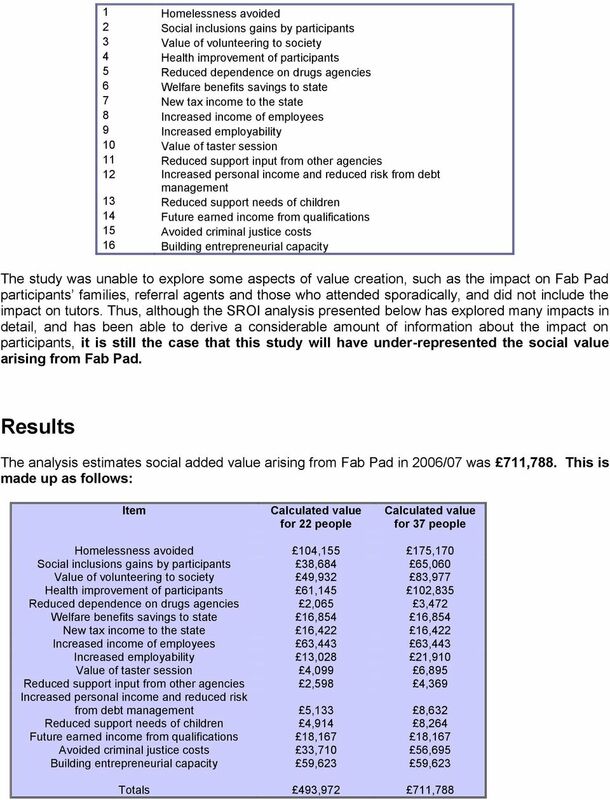 Emotional Support: I get support from staff and others at the Fab Pad if I have a problem. No matter what it is, I am not judged. If I am upset AnneMarie will do all she can to help. England. Your project and its outcomes. Acknowledgements This booklet has been prepared for the Big Lottery Fund by Charities Evaluation Services. England Your project and its outcomes Sally Cupitt with Jean Ellis Charities Evaluation Services Acknowledgements This booklet has been prepared for the Big Lottery Fund by Charities Evaluation Services. Yes? A career in social work in Northern Ireland. Do you want to change lives and make a difference? Do you like variety and change? A career in social work in Northern Ireland Do you enjoy working with people? Do you want to change lives and make a difference? Do you like variety and change? Are you confident, motivated and patient? Creative Scotland, Youth Music Initiative. Case Study Young Music Makers in Edinburgh. Helping young people believe in themselves. Notting Hill Housing T 020 8357 5000 1 Butterwick F 020 8357 5299 Rear of the Metro Building jobs@nhhg.org.uk Hammersmith W6 8DL Hello Thanks for asking about the Housing Officer role Notting Hill Housing. 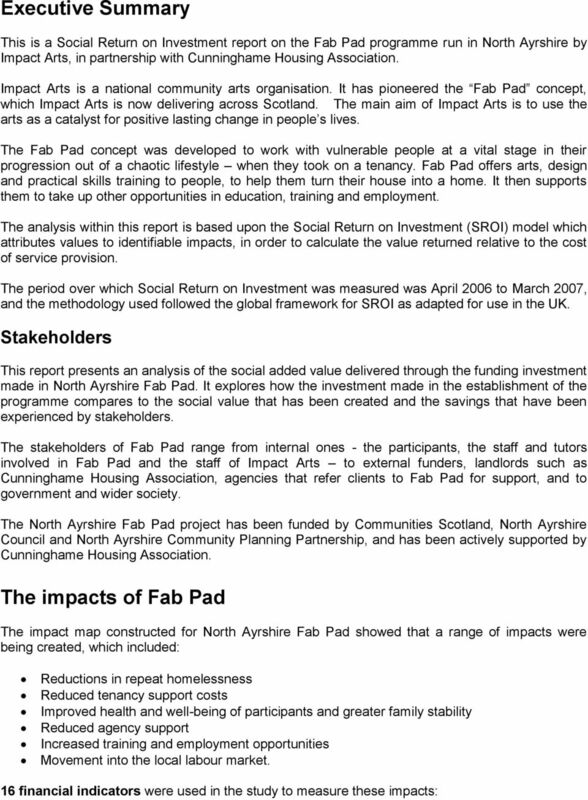 National Housing Conference 2015 Measuring Social Impact in Scotland. Craig Sanderson Link Group CEO 29 October 2015 cs@linkhaltd.co. The Hope Programme Middlesbrough, North East Community Action Against Crime: Innovation Fund Case Study 11 May 2013 Funded by Contents Summary What was the need? 3 What did they do? 4 Who was involved? Welcome Welcome to this year s Orbit Story our annual report for 2013-14. With housing an increasingly important topic on the political agenda, last year was a busy and challenging one for the sector.